McCormick Ground White Pepper is used in light colored dishes such as white sauces where black pepper would show as black specs in the foods. 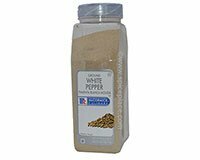 White Pepper is excellent as a general replacement for pepper anywhere. Use on chicken, steaks, porks. Eastern Shore Crab Cakes More Recipes..